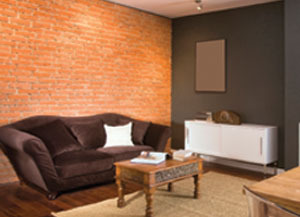 The use of brick on interior walls is a growing trend. Brick is extremely durable so it works well in high traffic areas subjected to wear and tear. The size and thickness of brick make it great at hiding imperfections in a wall when you’re working with a “less than perfect” surface. But more importantly, brick is commonly selected because it simply looks great. 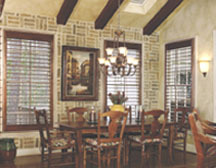 There’s a rich, rustic look that only brick can provide. And for those areas, it’s the perfect solution for your decorating needs. A key to staying satisfied when selecting brick for your home is to seal the surface once installation is complete. Left unsealed, a brick wall is a porous surface that attracts dirt and is nearly impossible to clean. Liquids are easily absorbed into untreated brick, causing stains that will remain as unsightly reminders of accidents and spills for years to come. Fortunately, the process of sealing brick is a fairly easy and inexpensive project. The first step is to clean the surface. For new brick walls, it is always best to wait 28 days after construction is finished so that the mortar has time for the alkalinity to get back to near neutral. Whatever stains are on the wall prior to sealing will be “locked” into the surface once the sealer has cured, so it is important that the wall looks the way you want it to look before sealing. If there is dried mortar spatter left over from construction, it will normally come off easily by brushing with a copper brush. Never use a steel brush when cleaning brick, as it will almost always leave a dark, black stain on the surface of the brick wherever it is brushed. If there are stains that have soaked in to the brick, try cleaning them off using a mild detergent and flushing with as much water as possible. For interior cleaning it is best to avoid cleaning with any harsh acid-type products. Ventilation and rinsing are critical, so these types of products are not always safe to use indoors. Once the wall has been cleaned and given sufficient time to dry, you are ready to start the sealing process. When selecting a sealer for your wall, you want to choose a 100-percent acrylic sealer. I always recommend selecting one that has a volume of solids no less than 15 percent, such as Defy’s Acrylic Waterproofing Sealer (www.defyinfo.com). With lower-solids sealers (those with a solids level in the 10-percent range), you can have difficulty getting an attractive, even sheen and it may take additional coats of material to get the look you want. When using acrylic sealers, the sealer can darken the surface slightly as well as add some level of sheen or gloss, so it’s always best to first apply a little material in an obscure location to make sure it’s the look you’re after before you seal the entire surface. Acrylic sealers are the perfect solution for use on walls, but avoid using them on floors as they simply may not hold up to the rigorous wear and tear of daily foot traffic. For application, acrylic sealers are more easily applied by simple brush and roller. For larger projects, a sprayer can be used. When applying by brush and roller, choose a roller cover with a heavy nap to easily coat the mortar joints. Select a cover with a minimum 3/4-inch nap up to as thick as a 1-1/4-inch nap, depending on the depth of the mortar joints. Coat the entire surface in the same manner that you would paint a wall and allow it to dry for a couple of hours. Once the first coat has dried sufficiently, apply a second coat in the same manner as the first and allow it to dry. The sealer will need to cure, or harden, for approximately 7 to 10 days. When curing is complete, you’ll have a beautiful, maintenance-free surface that will resist stains and be easy to clean for years to clean for years to come.